It is rare, but sometimes you develop a deep relationship with an artist the first time you encounter their work. It’s like falling in love. Immediately, a lot of your buttons are being pushed and it affects you personally. 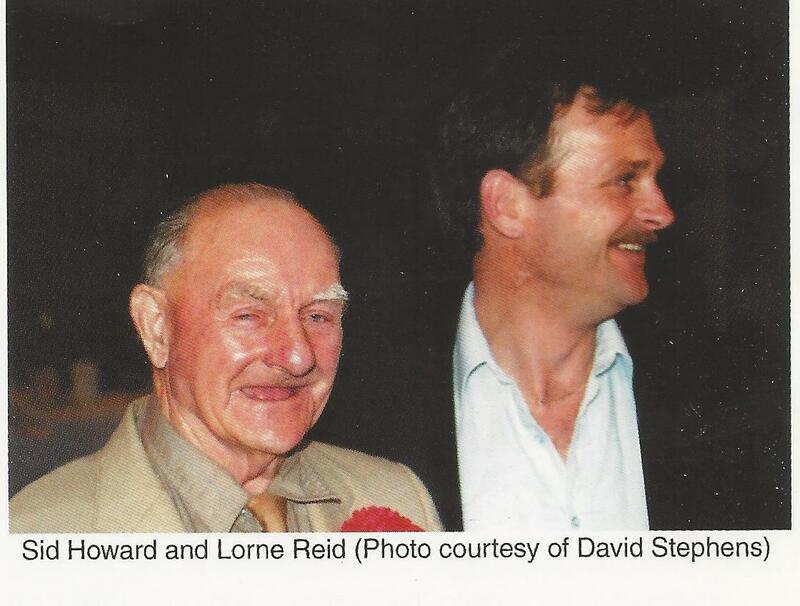 It was like that for me with Nova Scotia’s Lorne Reid. 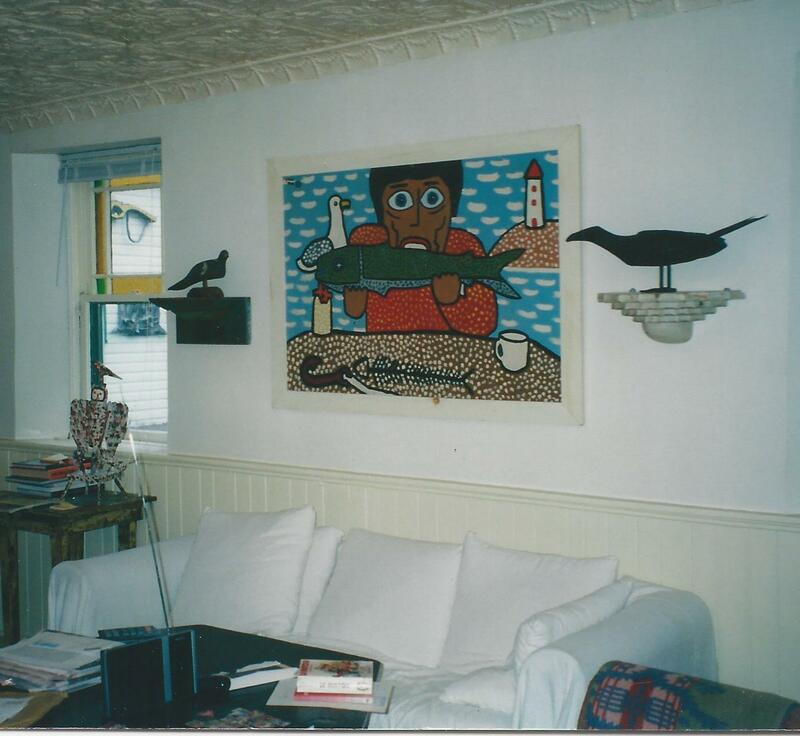 When we attended the Sutherland/ Amit auction in 1994 I was immediately taken by three of his works being offered there. I had never seen his work. The first and most dramatic was a 5 1/2 foot high sculpture of a mother holding a baby, painted in a pointillist style. Amazing work. Then I found a 11’ x 14” pointillist painting of a dog peeing on a fire hydrant. I loved it because it was amusing and in your face. Finally, and for me the most appealing there was a 6’x 3’ oil on plywood painting of a man eating a fish. Absolutely haunting and powerful image. Not at all pretty. Actually quite unsettling and not a favorite of my wife or daughter who were with me, but a painting that spoke to me directly. I was fortunate in that most people sided with my Jeanine and Cassandra’s opinion, so I was able to get it at a bargain price. They were fine with the thought that it would go into our collection of stock for resale but they were not so happy when we got home and I hung it above the living room couch. No matter where you sat in the room he was staring at you. His haunted look and the fish skeleton in front of him on the table suggest a hunger that cannot be satisfied. It is not a cheerful painting. I took a lot of heat for a few days but the controversy died down. Before long he became a member of the family and is in the background of many family Christmas pictures. I never grew tired looking at it. 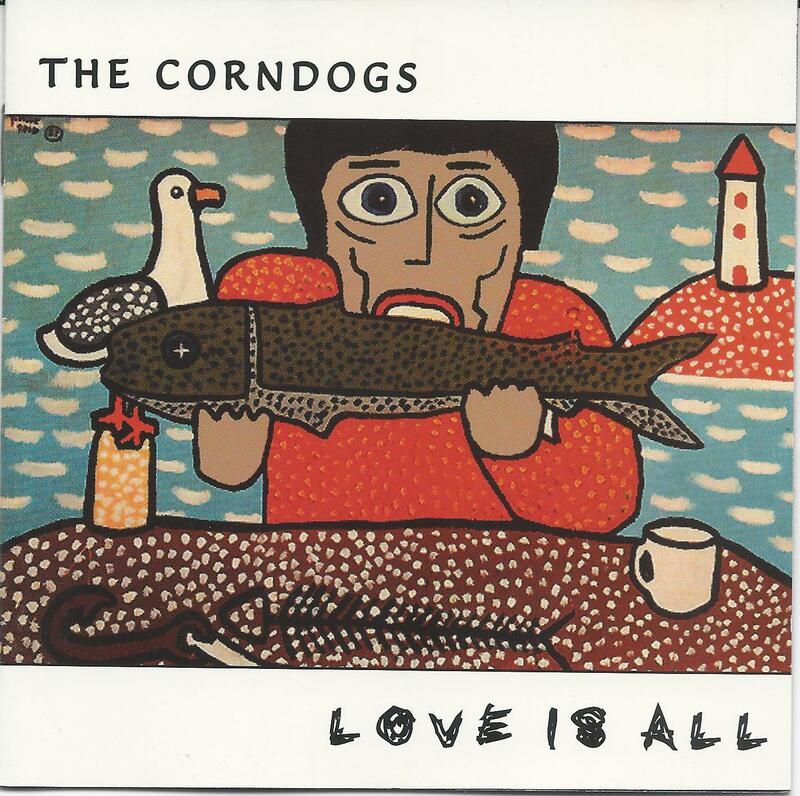 Then in 1995, my stepson Brodie who is a musician and member of the excellent Canadian band the Corndogs, asked me if they might use the image for there up-coming CD. I agreed to if I could get the permission of the artist’s mother, who was handling the estate. I got her number and called her out of the blue, as it were. What a lovely woman. I was nervous, but she was so immediately welcoming and friendly that my concerns quickly left me and we had a wonderful, and long conversation about Lorne. She was all too happy to give permission. The CD was released on Immune Records in England and did very well there, but never found a Canadian distributer. Still, I think it is a masterful work and I am happy that the painting has become associated with it. I think you can still buy it on CD Baby or one of those sites. The juxtaposition of the image with the phrase “love is all” seems appropriate to what I know of Lorne Reid. He was a searcher. He hitch-hiked around North America for 15 years, and then went back to Nova Scotia and became a dedicated artist. He painted and sculpted until his tragic early death by cancer at the age of 37. Lorne dedicated himself to his work and the work of other local artists. In 1989, along with artist David Stephens and Chris Huntington he was instrumental in creating The Nova Scotia Folk Art Festival and Picnic. He is considered by many to be one of the most important and significant artists to come out of Nova Scotia. 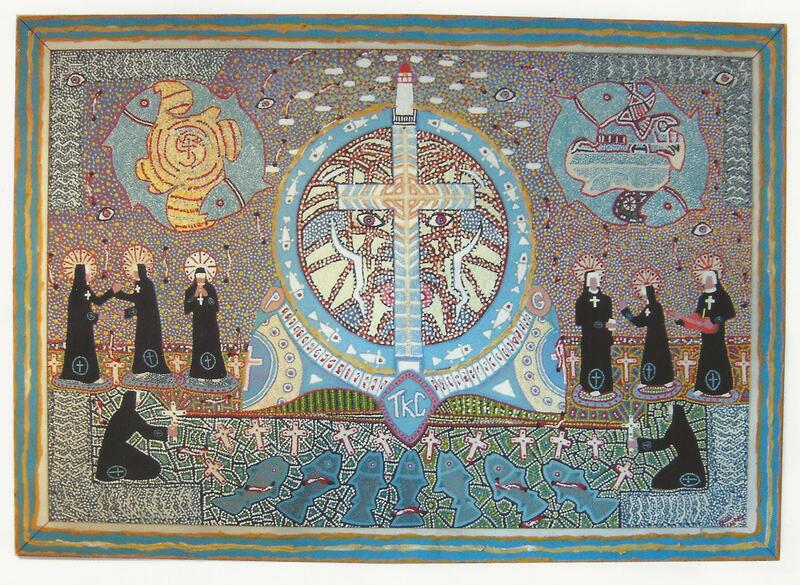 He was a member of what some refer to as the “new wave” of Nova Scotia folk artists. Younger artists who were influenced by the originals such as Sid Howard, and then took the energy and style and made it their own. 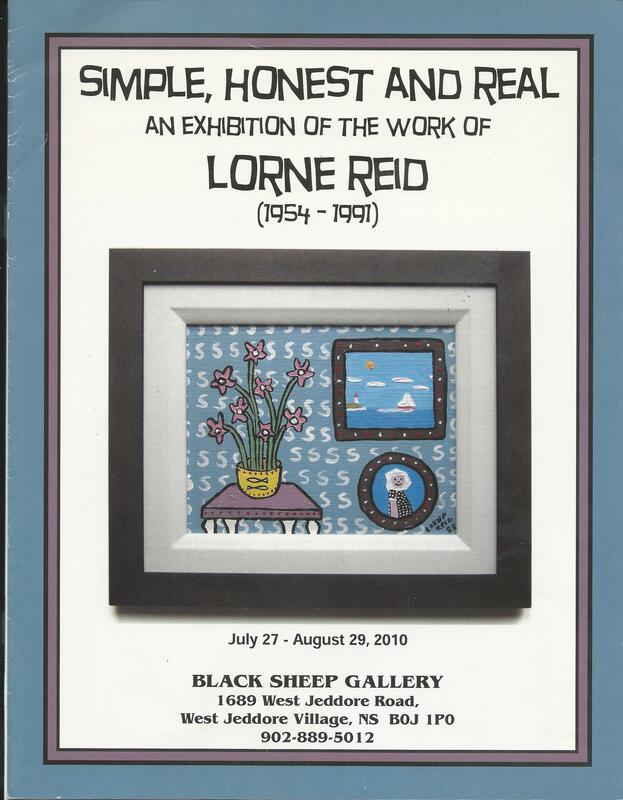 Fellow artist and close friend David Stephens estimates that Lorne did fewer than 100 small folk art paintings and perhaps a dozen larger paintings during his short career. He remains as one of my favorites, and I hadn’t thought about him much until this morning when I saw a clipping from the Upper Canadian coverage of the 2004 Bowmanville show that Adrian Tinline posted in the Canadiana Antiques Facebook group. There it is. 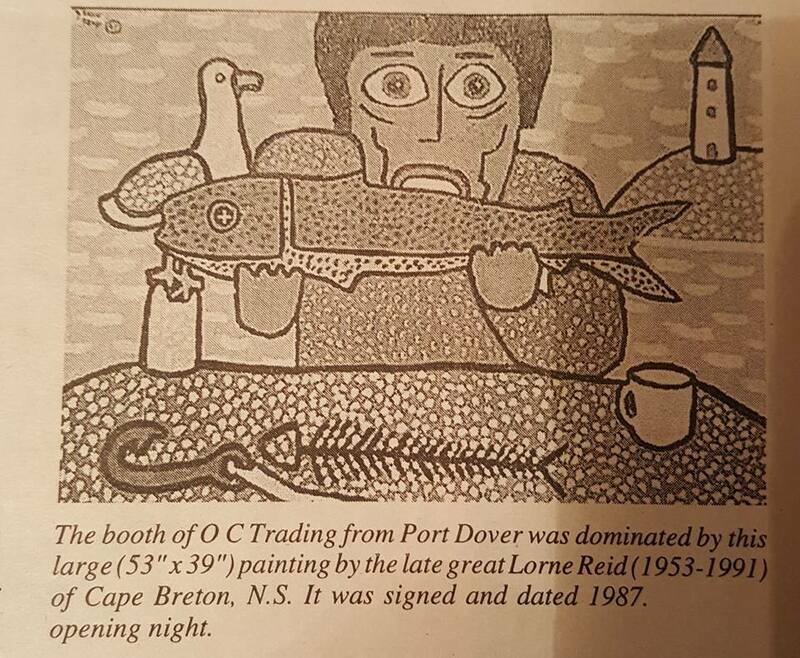 “Man eating a fish” which sold the opening night. I can’t say that what I feel is regret. I owned it for ten years and sold it to a good collection, but it still makes me feel a little sad, and just a bit haunted.